I've been cooking my way through one of my new favorite cookbooks. Vegan Richa's Indian Kitchen is a creative twist on traditional Indian recipes designed for the home cook. It's beautiful to browse through, with plenty of mouthwatering photos and ideas for little bites and meals, breakfast, sides, vegetable and legume curries, mains, flat breads, accompaniments and even desserts. There are easy recipes for those days when you don't want to fuss too much and other slightly more complicated ideas for those days when you have more time to hang out in the kitchen. All of the recipes are easy to follow and beautifully presented. For those new to Indian cooking, this is a great introduction with lots of useful information regarding the fundamentals of Indian cuisine. Your taste buds will thank you. 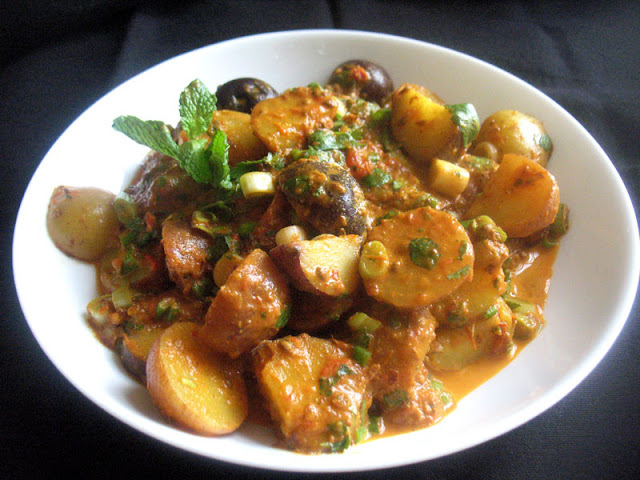 One of the earliest recipes I bookmarked to try is this one right here, with a few adaptations. 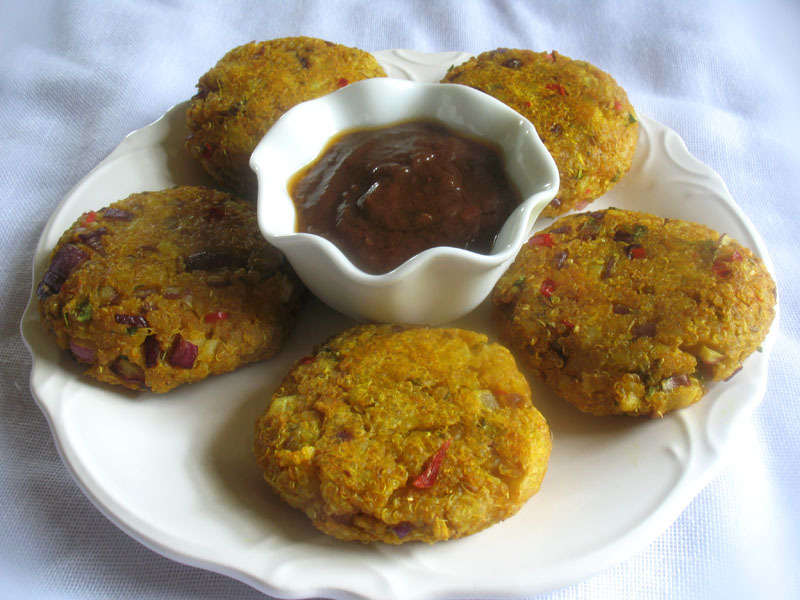 I adore little bites and when I saw that quinoa was made into patties with potatoes with Indian spicing, I was sold. Somewhat spicy, with a nutty flavor from the quinoa in addition to the potato, these simple patties have crisp golden-brown crust and a soft delicious interior. They're a well suited side to pair with tomato-based curries or just as light meal on their own with some chutney or sauces. 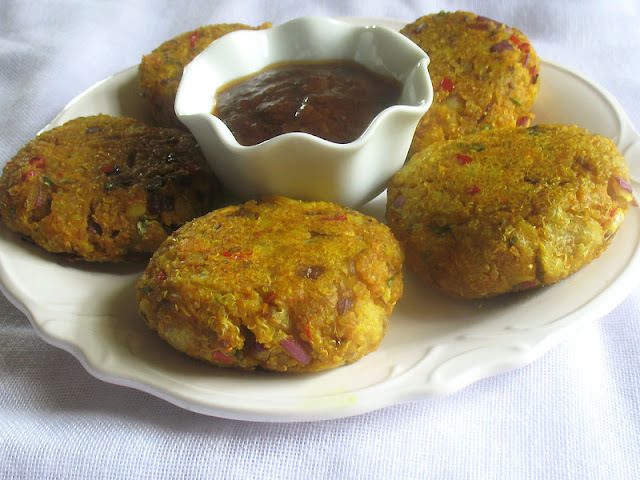 Tamarind chutney was my choice and it added a lovely tangy bite to the patties. Note: The opinions expressed here regarding Richa's book are my own. I purchased a copy because I follow her blog and feel in love with the book right away. In a large bowl, mash the potatoes with the quinoa. Stir in the cumin seeds, sun-dried tomatoes, onion, chilies, cilantro, ginger, coriander, cayenne, salt and oil. Mix until well combined. Shape into roughly 3-inch patties. If the mixture is too moist, add a few tablespoons of breadcrumbs or cornmeal. Transfer the patties to the prepared baking sheet. Preheat an oven to 425°. Brush each patty with a bit of oil. Bake for 15 minutes. Flip the patties and broil for another few minutes. Flip and broil for another minute until golden brown. Serve hot or warm with your favorite chutney or sauce. Reheat leftovers wrapped in foil in a 300° oven for 10 minutes. We just got a lot of potatoes in our CSA and I've been craving Indian flavors, so definitely going to try these! I made these last night...added toasted cashews..delish! I ate them with some leftover Korma sauce, really tasty! 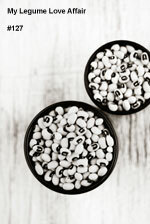 Tonight I'll try them with my homemade a cilantro cashew chutney! YumYumYum!! !